The featured marker is to the middle-right in this view, mounted in the walkway seen below the left-most window of the yellow building. An additional marker can be seen to the left in the foreground. The third similar marker is to the far left, outside of the park's fence in this view. In the distance is the colorful headquarters of the National Technical Institute (Instituto Politécnico Nacional de Campeche). east. Touch for map. 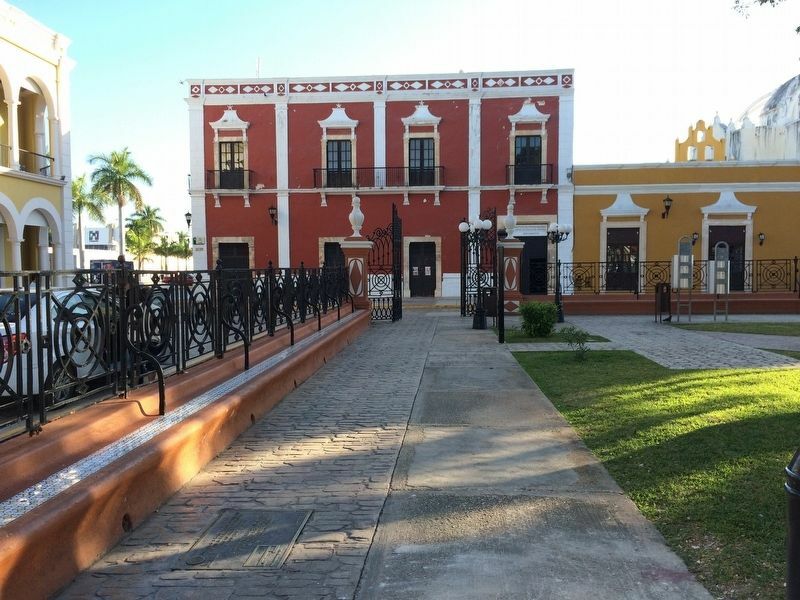 The markers are on the northeast corner of the Campeche central square (Plaza de Indepencia). Marker is at or near this postal address: 177 Calle 8, Campeche 24000, Mexico. Touch for directions. Other nearby markers. At least 8 other markers are within walking distance of this marker. Campeche Library (within shouting distance of this marker); The Birthplace of Justo Sierra Méndez (within shouting distance of this marker); "The Palace" Cultural Center (within shouting distance of this marker); Independence Square (within shouting distance of this marker); Bastion of Our Lady of Solitude (about 90 meters away, measured in a direct line); Pedro Sainz de Baranda y Borreyro (about 90 meters away); Gate to the Sea (about 150 meters away); Temple of the Sweet Name of Jesus (about 180 meters away). Touch for a list and map of all markers in Campeche. More about this marker. 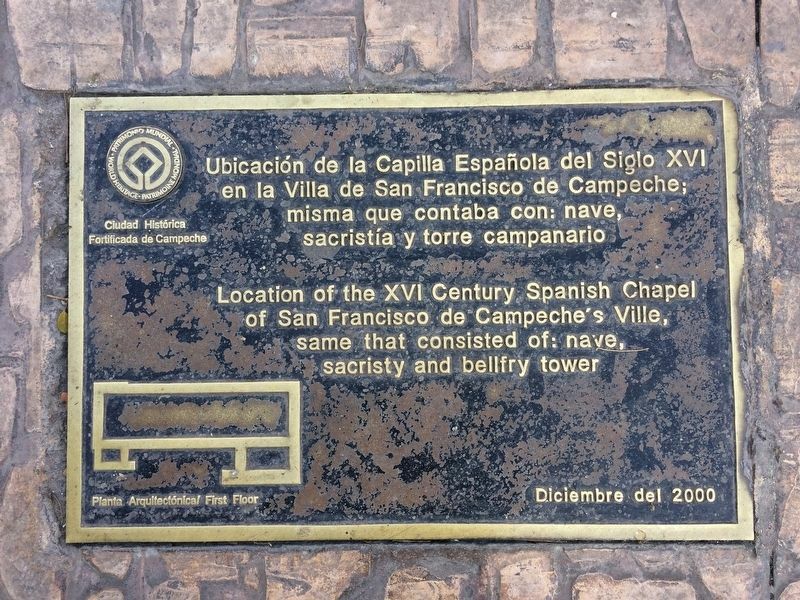 There are three almost identical bronze markers set into the park's walkways, marking the historical corners of the "La Española" Chapel. More. Search the internet for "La Española" Chapel. Credits. This page was last revised on July 28, 2018. This page originally submitted on January 28, 2017, by J. Makali Bruton of Querétaro, Mexico. This page has been viewed 145 times since then and 7 times this year. Photos: 1, 2. submitted on January 28, 2017, by J. Makali Bruton of Querétaro, Mexico.